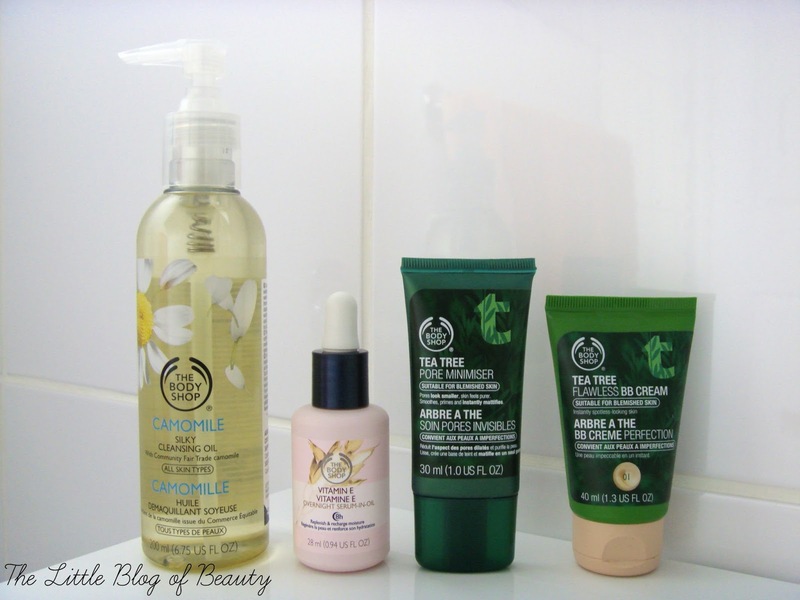 I realised I've bought several products from The Body Shop over the last couple of weeks so I thought I'd do a quick post to show you what products I've chosen. Full reviews will of course follow in the future when I've had a chance to test out each product. I've seen the Camomile Silky Cleansing Oil (£10) popping up on several blogs and have read nothing but good things about it, so I was curious to give this a try. I don't tend to use cleansing oils so this is a bit of a first for me. I probably won't use this to remove my makeup, as I usually use a micellar water, but I will use this either for my second cleanse or maybe as my morning cleanser. I don't think I've seen the Vitamin E Overnight Serum-in-oil (£12) on many blogs but nevertheless I'm still curious about it. A serum in an oil? I wasn't sure what this would be like but after putting a small drop on the back of my hand in store I discovered it's a very light, quite runny oil that feels and smells very luxurious, although it only has a very light scent. I'm really looking forward to trying this one out. I actually got both this and the cleansing oil on a buy one get one half price offer and I was also allowed to use my Love your body card for a further 10% off. So I got both for £15.30 and the fact that I had a £15 gift card meant I actually got both for just 30p! I'm a fan of Tea Tree and for quite a while now I've had my eye on the Tea Tree Pore Minimiser (£7.50). Although this isn't actually sold as a makeup primer (you'll find it under skincare on the website) I know this is how a lot of people use it. I really haven't got on with makeup primers in the past but I do want to find one that will provide a good barrier between my chin and makeup on set to try and stop MAC foundations keep breaking me out. I have high hopes for this one, please live up to them little primer. I'm certainly not a fan of BB creams at all, having not liked a single one I've tried (admittedly I've not tried many but that's because I don't like them!) but as soon as I saw The Body Shop were releasing a Tea Tree Flawless BB cream (£8) I immediately wanted to try it. Isn't it strange how you can really not like one type of product but then find yourself lusting after a new release? This is available in three shades and obviously I picked up the one closest to the shade Casper (the friendly ghost). I've tried this once so far and lets just say I don't hate it, in fact I actually quite liked it, but obviously more testing is required. Have you bought anything from The Body Shop recently? I just love Body Shop! I've also seen many rave review about the Camomile cleanser but i'm not quite sure what to make out of it! And i've also seen good comments on the Vitamin E serum/oil - would love to see what you think! I've just bought the usual Body Butter in passionfruit - it's my absolute fave!